This southern part of Tasmania fits the description as tautly as a full sail. In the dark rocks of the harbour, in the wind knifing up hilled streets, you feel the presence of that continent. Though it’s ten days by ship, a desert of boilerplate sea and domes of vacant sky, this is still the last point of land between you and it. You feel that gulf snap back like elastic. Tasmania, hunched with its head turned away in a futile attempt to deflect that frozen attention. It’s there, as unavoidable as a stranger at the other end of an empty beach, footprint by footprint reeling you in. The headlands, the craggy jumbled bluffs, speak of drama. They stir a response. In Hobart during the last World Cup, lifelong Queenslander and free-jazz user of words Matthew Hayden treated co-commentator Ramiz Raja to a verbal version of the sort of discordant flute improv featured at David Walsh’s MONA festivals. These images of difficulty and darkness are the kind that come to mind when the second day of a Test is dissolved in cold rain. Cricket Tasmania authorities were not fond of that perspective. 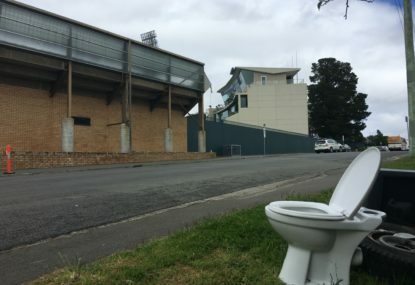 Fair enough – each year we play here, there is talk of whether Hobart deserves Test matches, given the weather and small crowds. You can understand some local defensiveness. This year, and last, the Tasmanians look like victims of scheduling. Getting 8000 people to an opening day with a miserable forecast in early November is a decent result, but imagine a match in the kinder and more reliable climate of January or February? These days Australia’s Test season finishes a week into the new year – a return to the later-season scheduling of old might be the thing to revitalise it as desired. Neither has Tasmania been helped by the standard of recent play. Last year, a shambolic West Indies folded in two and a bit days. Twelve months on, the home side followed the same example. A year previously, Adam Voges had been lashing the ball to all parts in an unbeaten 269, at the fastest strike rate for a score that big of any batsman bar the outlier’s outlier, Virender Sehwag. This year he got a first-baller from an unplayable delivery, then froze in the second innings to give up his wicket and most probably his Test career. The harsh conditions mentioned in Hayden’s soliloquy applied to all of Australia’s batsmen, cable-tied to the green crease as cricket balls whizzed past the edge, the stump, the glove, the grille. Seam and cut, South Africa’s trio of fast bowlers using their armoury to expert effect. We didn’t even see seven sessions of play. South Africa toughed it out to tally just over 300, incomprehensibly enough to win by an innings and the width of the Derwent. 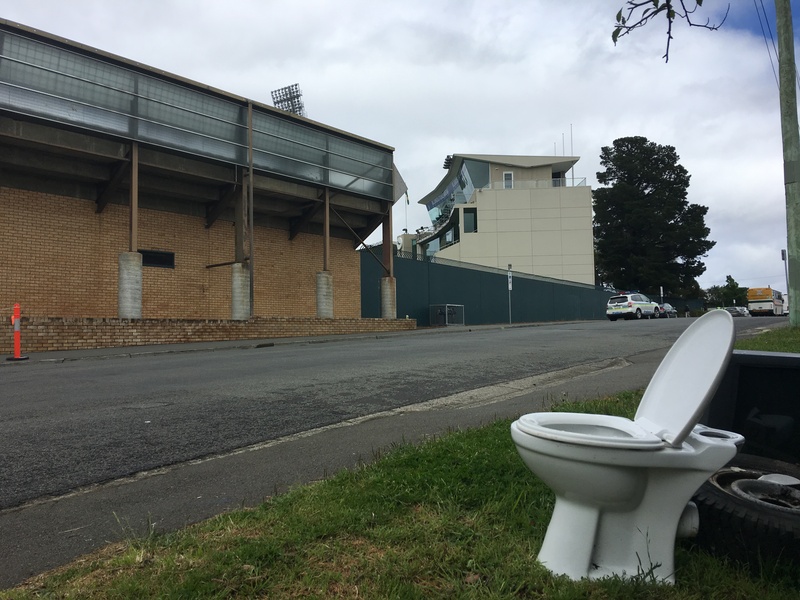 Across the street from Bellerive before the second day of play, in front of the row of houses facing the stadium’s blank shoulder blades, someone had dumped a decommissioned toilet on the nature strip. It may have just been hard rubbish week, but symbolically it sat nicely as comment on play. The seat of Australian power flipped, the top side dethroned. “The Australian cricket cistern is broken,” responded Cricinfo reporter Brydon Coverdale to the image above, and there have certainly been rumblings in the pipes since the game wrapped up. The captain demanded players who will fight, the coach was questioned about a contract signed three months ago, the CEO returned to Hobart for a press conference that hinted at a state of emergency. All three said there would be personnel changes for the next match, even though none of them was the chairman of selectors. Next up was that chairman announcing that he was going to go outside and may be some time. Antarctica had claimed another. What a strangely bereft performance it had been. By the second half of Day 4, the only person on the field was a security guard apparently protecting the entire arena on his own. Standing at midwicket, he was soaked by a trapdoor sprinkler that popped up like a camouflaged sniper. Its target gave the finger, dually, to a distant heckler in the stand who may have triggered the attack. Quiet returned. Siege bowling and threatening skies had given way way to peace and to weak sunlight. On the morning of what should have been Day 5, the Tassie Tigers state squad had a loose practice session on the Test wicket, the river flowing broad behind them out towards colder waters, the players middling the ball with apparent ease.